Media and Contents: Soft cover; B-5 Format (7 x 10 inches); 96 pages plus covers and five profiles and three pictures in color. Advantages: Excellent photographs with English text and subtitles. This newest offering in the Finnish Air Force History series from Keri Stenman Publishing covers the Soviet bombers used by the Finnish Air Force during the Winter, Continuation and Lapland Wars. The bombers were the Tupolev SB, Ilyushin DB-3M, the Ilyushin IL-4 and Petlyakov PE-2 / PE-3. 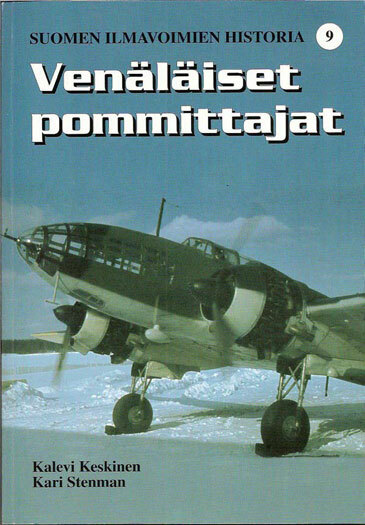 Although this is part of the Finnish Air Force History series, for those interested in Soviet aircraft, this volume makes a perfect companion to the previously released Russian Fighters in the FAF. Like the other volumes in the series, this one is well organized and presents the information in parallel columns of Finnish and English. The authors provide a brief background on the development and procurement of each of the aircraft. The specifications of the aircraft in Finnish service are then given. Finally, the use of each aircraft by various units in the FAF is presented. As one would expect from this series, there are numerous high quality photographs. Nearly all of the photographs are of the aircraft in the field, but there are a few interior and cockpit pictures. With regard to the operational history of each individual aircraft, this volume, unlike the Russian fighter volume, provides the information in English at the end; a most welcome improvement. The Finnish Air Force History series continues to go from success to success, and this volume is no exception. As I noted in the beginning, even if your interest is confined to Soviet aircraft, one will find this a rewarding addition to one’s library.